The 2QD is an ‘old’ product: it was about our simplest 2 quadrant controller, but for general use we would recommend our Porter 5 or Porter 10. This page is now for reference only. The 2QD is a simple motor speed controller for 12v, 24v, 36v and 48v battery operation. They are ‘Two Quadrant’, i.e. they control acceleration and braking. The controllers are state-of-the-art MOSFET chopper drivers giving fully variable fine speed control of all motors at up to 100A intermittent. The controllers are primarily for mobile uses such as miniature railways, model cars, golf buggies and golf caddies but may be used for other applications as well. The controller is ideal for industrial purposes and is ideally suited for use as a building block where control is from a computer of similar system. Being an open circuit board with easy accessibility, they are also ideally suited to prototype and experimental work and to small quantity applications. Input 10k to 100k pot. Heatsink is adequate for normal motor use (i.e. intermittent operation at maximum output). The integral heatsink may be bolted to an additional heatsink if required. The current limit reduces automatically if the controller gets hot, reducing the danger of failure. Power and motor connections are by 6.3mm tabs. Pre-crimped wires can be supplied as an optional extra. Circuit can be used to drive loads such as lamps which will work off a chopped d.c. supply. Optionally the controller can be supplied with regenerative braking disabled, for use where braking is undesirable. Reversing can be done by using two controllers back-to-back to give a full four quadrant drive. Alternately use a switch or relay to change over the armature connections. For best results, 4QD also manufacture reversing controllers (4QD, Pro and NCC series). 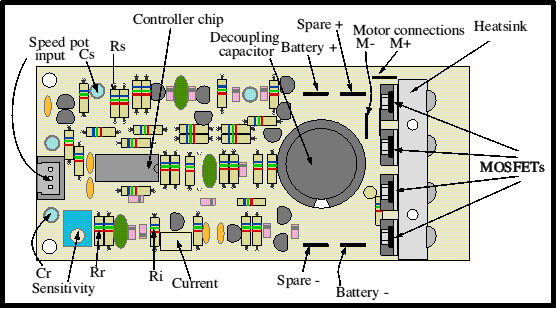 The diagram above shows the features of the controllers, which are un-cased circuit boards. They are assembled, fully tested and guaranteed. The diagram below is a side view, showing the mounting arrangement. Input is suitable for a standard potentiometer. There is an on-board adjustment to alter sensitivity to suit different operating mechanisms. A connector is supplied. Various speed controls can be supplied as extras, including a spring-return-to-zero speed pot arrangement suitable for hand operation.